This delicious spread can be made at home with heavy cream. This guide is about making homemade butter. This is a good food trick to do with your children. We're going to make real butter using heavy whipping cream and your blender. It's easy and a nice way to teach your young ones something about food that they may have never seen. Cool your blender container with ice or let it sit in the refrigerator for about an hour. Remove from fridge and get it ready to use. Pour 16 ounces of heavy whipping cream into blender. Turn on blender for no more than 1 minute at the time. Your cream is going to turn into butter fairly quickly. As soon as small globs of butter begin to form, shorten your blender spurts to 15 seconds at the time. The globs of butter will gather together, and when it's all in a clump, carefully pour off whey and set aside. Place butter in a bowl and refrigerate for 30 minutes. More whey will seep out and when you stir, you can get more out. When the butter is fairly free of liquid, you may add salt to taste, not too much. Stir the salt in and refrigerate for 30 minutes. If you see more liquid seeping pour it off, and shape your butter as desired. 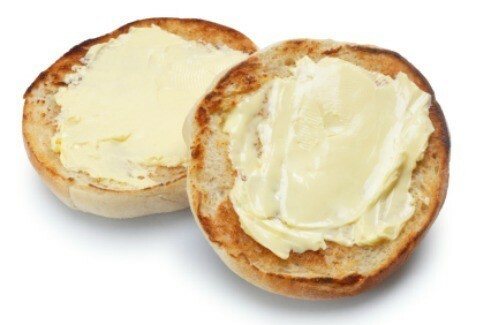 Be sure to let them tell everyone that they made "butter" today. Have fun and enjoy watching them having fun too. You just made another memory that they'll never forget. Making your own butter from heavy whipping cream is very easy, saves you money, is better for you than margarine, and you also get buttermilk (an expensive item in the market to buy). Buttermilk is good to drink, and is great for baking and making salad dressings. Note: The internet is loaded with how to's for making butter. I tried to make butter with whipping cream and it just turned to whipped cream what do I do? You need to use heavy cream to make butter instead of whipping cream. They are two different products. Heavy cream has the higher fat content necessary to produce butter. You should be able to find heavy cream in your grocery's dairy section. It's fun to make butter, using heavy cream as other commenter says, but it's certainly not economical. I used to get raw milk and saved my cream and tried it. I think I got about 2 tablespoons. I know this was 3 years ago but since I just made butter, again, from whipping cream, I thought I'd let people know that the only diff is that whipping cream has less fat than heavy cream. She just didn't whip long enough. I haven't ever used heavy cream and I can make butter in just a few minutes with whipping cream. I'm getting lucky this weekend and getting fresh cream to try. You don't need a churn to make butter. You can do it THIS way using a hand whisk or an electric mixer at slow speed. In the summer, churn your cream at temperatures between 52 and 60 degrees. In the cooler seasons, try for between 58 and 66 degrees. The length of time it takes for churning and eventual texture of butter depends on bringing the cream to these temperatures ranges. You can adjust the temperatures by placing the cream container in a water bath of the correct temp. Beat or whisk the cream with a steady regularity. Continue beating until part of it turns butterlike (sudden, hard texture) with liquid (buttermilk) in the bowl. This happens after about 15 minutes. Pour the buttermilk out (you can save it to use for something else) and add cool water, beat gently some more, drain again. When the butter beads are completely washed, add a small amount of salt. (1/4 tsp. of sea or kosher salt to lb. of butter). If you are only making a tiny bit, you don't have to salt it because it will be consumed quickly with no spoilage. Beat the butter on a flat surface (marble top or clean counter) Use a rolling pin or flat meat tenderizer large wooden spoon to press out ALL the water you can. Do not use any plastic in the above steps. Do not store in plastic. Use a glass jar or a wooden box. Plastic will greatly affect the taste.The whole process takes about 30 minutes, no matter how much cream you use.